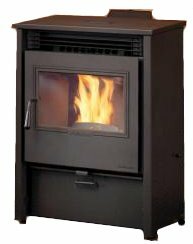 Travis Industries' AGP pellet stove (burns All Grades of wood Pellet) have moved towards the Harman concept with this freestanding replacement for the Avalon Newport and the Lopi Yankee Bay. This stove has a bottom feed auger that allows new fuel to push ash out of the burn platform. Called a platform, not a pot because it's flat to allow ash to fall into the ash pan. The continually turning bottom auger has fuel metered to it by a horizontal rotating drum at the base of the hopper. The exhaust vent is at the center of the rear of the stove, making corner installation neater. The Avalon Newport Bay and Lopi Yankee Bay inserts are still available. And here's a picture of the Lopi AGP, showing the different detailing of the cast iron door. The door style must be specified and ordered along with the stove. Heating Area Up to 2000 sq.ft. Max. Heat Output 41000 btu/hr. Min. Heat Output 11480 btu/hr. Emissions Less than 1 gm./hr. Window Size 14 in. by 9 in The Lopi AGP window size is slightly smaller, but does a good job of hiding the burn platform. Rear Vent Height 7.25 in. Colours Black - the side panels can be painted in custom colours. Construction Type Fabricated steel, stainless burn pot, cast iron door. Automatic Shutdown and Re-ignition Yes, using a thermostat. Third to fifth year: - parts and labour on Firebox assembly, door assembly and auger assembly. Manual or digital thermostat, or Travis's Smart T-stat for more data and information. A warm ash vacuum will assist greatly with the maintenance schedule. Yearly: - Clean firebox liners, clean lower exhaust duct, clean convection blower, clean negative pressure tube, clean the vent system, clean under fire platform, adjust door hinge and latch and check for air leaks. 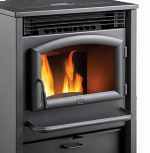 If you would like to leave a review of the AGP pellet stove, please use the form on the contact page.